This knitted bag is a simple to knit handbag pattern that's great for beginners and all knitters who would like to make one. They're always a fun knitting project and simple to create. This bag pattern is an easy to knit project using knit and purl stitches and it's easy enough so you can sit and watch TV or chat with your friends. I like that kind of knitting pattern don't you? I wanted a simple knitted bag for casual running around days that's big enough to hold everything and comfortable on my shoulder, plus easy enough to find things. And this is it. Hope you like it too. Finished Measurements: Lying flat approximately 16 " X 10"
Notes: I made a 1 inch hem leaving the ends open so that I could slide the handles through easily. This hem will be folded over to form a pocket for the handles. Slip the first stitch of every row as if to knit and knit the last stitch of every row. If you don't want to knit the handles you could look in your local craft store for some prettier ones. I tried to find some but unfortunately I couldn't find any so I just knit them instead. Starting with hem and size 5 needles cast on 67 sts. Work in Stockinette stitch for 9 rows ending on a knit row. Work 14 rows of Stockinette st. to form bottom gusset or approximately 2" ending with a knit row. Next Row: Switch to size 5 needles and knit Stockinette st. for 8 rows for hem. Note: When knitting side gussets you'll be matching the width of the sides to the width at the bottom of bag so it's all symmetrical. And a little reminder, you can make both gussets at the same time by using 2 balls of yarn or by using both ends of 1 ball. Cast on 8 sts. And work garter stitch for 10 inches (length of side of bag) and cast off loosely. Seam gussets to the bag. Weave in ends. Lightly steam the hem so it lies flat and sew into place leaving ends open for the handles. I made I-cord handles in each color then seamed them together. I was trying something a little different. You can make them any length you like. When you're finished just work it through the hem on your bag. Then seam ends of I-cord handle together. If you would like to try another very simple knit handle you can cast on 8 sts and knit garter stitch until you reach the length you would like for the handle. Keep in mind that garter stitch is very stretchy so it will lengthen when you slip it on your shoulder. The nice thing about this handle is that it will lie flat on your shoulder and won't slip off. It isn't always necessary to line a bag. It just depends what you will be using it for. I have to admit that I don't sew very much but I did decide that I would line this particular bag. You can use a sewing machine to seam the fabric or if you prefer you can also hand sew it. I found a great video that will help show you how to line your bag. 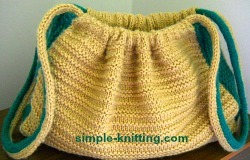 Even though this pretty bag is crocheted the lining process is the same.